A chilly spring dampened customer traffic last quarter, but the discount retailer still projects healthy operating gains for the full year. Dollar General (NYSE:DG) announced earnings results this week that showed off its resilience in a selling environment that's becoming tougher for many traditional retailers. Despite weather-related customer traffic challenges, the company managed steady sales and profit growth. It also affirmed its broader 2018 goals. More on those targets in a moment. First, here's a closer look at the first-quarter results. Data source: Dollar General's financial filings. Sales slowed a bit, consistent with the experience of most retailers, in part because of an unusually slow start to the spring selling season. But Dollar General still managed to expand revenue. Operating costs increased, meanwhile, but were more than offset by a lower tax rate. Comparable-store sales improved by 2.1% to mark a minor deceleration from the 2.7% rate the retailer managed in fiscal 2017. The growth came entirely from increased spending per visit as customer traffic ticked lower. Gross profit margin expanded to 30.5% of sales from 30.3% as the company raised prices and did a better job at minimizing theft. These gains were mostly offset by a shift in demand toward low-margin consumable products. Selling expenses rose at a faster pace than revenue thanks to higher labor costs. 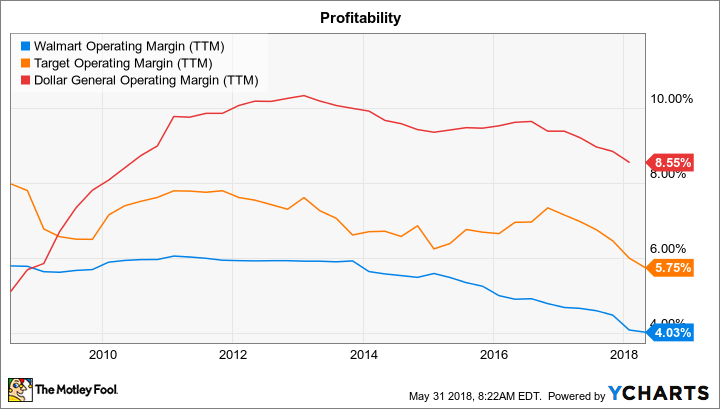 Operating margin dipped to 8% of sales from 8.5% a year ago, but lower tax expenses yielded a higher bottom line, with net profit margin rising to $365 million, or 6% of sales, from $279 million, or 5% of sales, last year. Dollar General invested $165 million in the business by opening 241 new stores and remodeling 322 of its locations. Executives highlighted their success at boosting revenue and profitability during a difficult quarter. "Our team delivered strong sales growth," CEO Todd Vasos said in a press release, "a solid same-store sales increase, and gross margin expansion, while continuing our cost containment strategy." The revenue uptick would have been greater, management estimated, except for the negative impact of "unseasonably cold and damp weather." The weather issues appear to have passed, though. "We are pleased with the start of the second quarter," Vasos explained, "and based on our year-to-date performance and outlook, we are reiterating our full-year guidance." Dollar General still believes it will increase sales by 9% this year, thanks to the addition of about 1,000 new stores and a modest increase in sales at its existing locations. And, unlike full-price giants like Target and Walmart, who are spending aggressively to build out massive e-commerce infrastructures, Dollar General's profitability outlook is more stable. The company expects operating margin to hold steady at 9% of sales, compared to around 5.5% for Target and approximately 4% for Walmart. WMT Operating Margin (TTM) data by YCharts. With tax expenses falling, that should translate into earnings of between $5.95 per share and $6.15 per share in 2018, up significantly from last year's $5.64 per-share haul. Investors can also look forward to plenty of direct cash returns on the way, with stock buybacks on pace to reach $850 million, or a bit more than the $725 million Dollar General is planning to invest directly into its growth initiatives this year.